You finally found your new home, and now you are a facing the not so easy task of moving your belongings. By hiring a professional moving services company, you will not only save money and time, it will also give you peace of mind and have a stress-free moving experience. To help you avoid moving services scams, we have made a list of top 5 things you should look for in a moving company. This list will also help you determine the safety of your items and get best of service you can get. 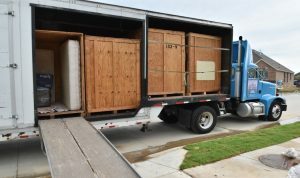 There are multiple reasons you want to start local when choosing a moving services company. Local companies will have a faster support system since they are near you. They want to keep a good reputation in their communities, so they will avoid difficulties that might generate disputes. It will also be easier for you to verify their existence and physical address, which takes us to the next item on the list. Verifying physical address is an essential step in the process of choosing a moving services company. Most moving scams result from finding companies on the internet that make impossible promises, and offer low price services. In most cases if you can’t find their physical address they don’t really exist. Most of these companies will have an invalid physical address and have sketchy domain names for their websites. Doing a quick background check will help you find out if the company genuinely exists. A reputable moving company will proudly tell you which licenses and certifications they have. Moving companies must have a USDOT and MC numbers. You can also do your own quick research about the companies you are considering to hire. You also need to know what kind of moving insurance policies they offer. Companies accredited by Better Business Bureau (BBB) are in good standing. At Garrett moving & Storage, we have been continuously accredited by BBB for more than 5 years now. In our previous article about red flags for moving scams we talked about the “Psychic Mover.” There are certain companies that will offer you an estimate over the phone, or through their website without setting foot on your property. We recommend that you stay away from these companies. Even though they may seem to provide you with the best deal at first, you might end up paying extra, hidden fees. Your moving company must send a rep to do an inventory and provide you with a written estimate. An actual estimate is usually based on the size and weight of your belongings and the distance you are moving them to. It is recommended to look for online reviews, customer satisfaction scores and success stories before hiring anyone. The longer the company has been in business, the more you can rely on it. Companies with bad service don’t last long in business. At Garrett’s Moving & Storage we have been serving happy customers for more than 24 years. A quick internet research can save you from being one of the victims of moving scammers and save you a lot of money. You can also find out if there have been any complaints against a company on websites like bbb.org, or moving.org. Our blog and help center have more information on how you can take advantage of our professional services in in Storage and moving Services. Please call us directly with any questions, or if you’re ready to schedule your on-site moving estimate at 972-487-5843. This entry was posted in Moving Stories, Stress Free Moving Tips and tagged accredited, bbb, moving companies, moving services. Bookmark the permalink.